Love the colors and patterns in this design. It is a stunning combination of ribbons and labels in stunning teals with orange accent . This collection has four pattern repeats in it - the two you see here and two additional ones with wavy ribbons. Use the four to create a stunning bedroom or bathroom. For our teal ribbon & labels design, we chose the straight ribbons with the labels in the concentric style. 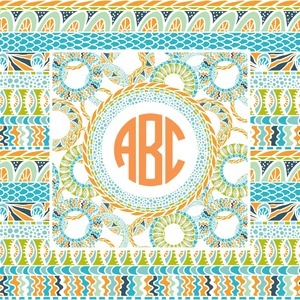 We chose a coordinating label with a circle monogram for personalization in the coordinating orange. You can customize the design using our system - change only the personalization to your initial or change it all including the design style, change the backgrounds, the labels, the monogram, the color, the fonts. Our rendering system lets you see all your changes as you make them.